We invaded the Sirius/XM radio station downstairs in the Austin City Live building, before the NYE concert in Austin to visit with Dallas Wayne. Always a treat to hang out with Dallas, and watch him work. Once again, Sirius/XM Radio broadcast Willie Nelson & Family’s NYE show. 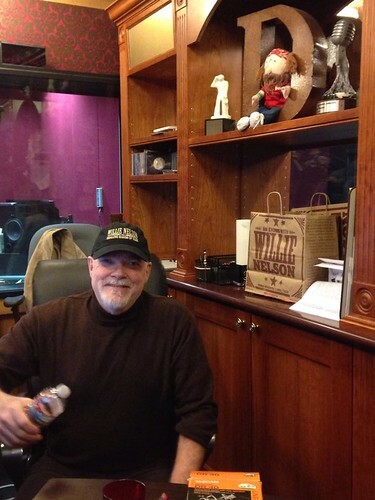 This entry was posted on Thursday, January 1st, 2015 at 10:06 am and is filed under Dallas Wayne, Willie's Place; Willie's Roadhouse, Sirius/XM; radio. You can follow any responses to this entry through the RSS 2.0 feed. You can leave a response, or trackback from your own site. always enjoy your music…@ Howe, Indiana!!! dallas : Iove your show ( willies roadhouse ) , but how about including some records by the ” confederate railroad “. Good cuts , such as …… 1 ) she took it like a man or long gone or time off for good behavior or black label / white lies . they are all good and seem to fit ” willies roadhouse . I listen to your program and Willie’s Roadhouse at home, in my shop, and on the road. My question is why don’t we ever hear Gary P. Nunn songs? He certainly is country and a Texan through & through. Is his music banned for some reason? Love the old tunes, love to listen to your program. If you cac play the songs. Blue and the wayward wind. In the mean tim I will sit back the great music. and me our song. Can you PLEASE play it. and more Jerry Lee Lewis — the country side not Great Balls of Fire or Chantilly Lace. Jerry had some great honky-tonk numbers. Thank you for letting me sound off. Dallas I love your show and listen to you all the time. I live in Florida. I was wondering if you could play more of Bobby Flores please? He is awesome. Thank you so much! You are one of the most talented musicians. We saw you on Liberty of the Seas in February! Would love to we you in person, again. Just heard “Gwen”. Are you kidding me? Without question the BEST thing you have ever done. This MUST be played at full volume. What a treat. I am looking where I can buy Mel Street CDs. Would you please play Justin Trevino for my birthday today! Love your program and listen to it everyday.